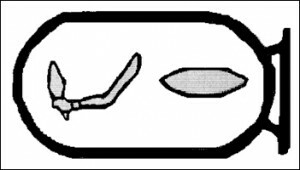 The cartouches of the pharaohs Djoser and Sekhemkhet both contain the hieroglyph for Nht: the ‘Strong Arm’. One of the most majestic statues from the early Dynasties is the almost life-size, red-painted limestone figure of pharaoh Djoser, found in its original setting, the serdab, a small chapel built against the northern front of the Djoser-complex. 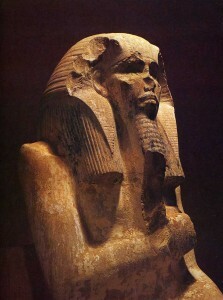 The statue still radiates the formidable power of Nht, the Strong Right Arm (original at the Egyptian Museum in Cairo). The Djoser-complex was orientated to the Pole star Thuban, azimuth ca. 2.4º (east of north); it was therefore built around 3,150 BCE.